I've got a feeling that it's gonna be a wonderful day! And he's shining a salute to the American race. —Stan Smith singing the show's theme song. The second cartoon sitcom from the creator of Family Guy, Seth MacFarlane. A pillory of American Ultra-Conservatism played out on Rupert Murdoch's network, it follows the daily life of initially-paranoid and extremely patriotic CIA agent Stan Smith, his over-protective wife Francine, nerdish teenage son Steve, and liberal and rebellious teenage daughter Hayley. 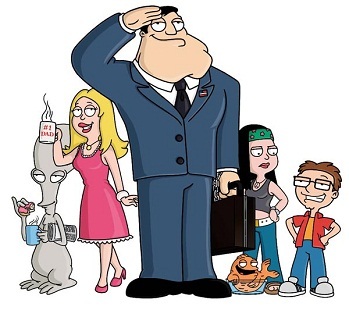 The pilot episode explains that, on a mission, Stan uncovered a runaway talking alien named Roger, who lives in the family's attic for protection from getting turned in to the federal agency, until he adapted more to the outside world and became more outgoing through the use of various disguises later in the series. They also have a talking German goldfish named Klaus, who used to be a human. Early in its run, American Dad was viewed as a clone of Family Guy, but it quickly outgrew this reputation and developed its own identity. It has accomplished this largely by emphasizing story and character development and conspicuously avoiding most of Family Guy's trademark shticks, like the Cutaway Gags, Flashback Twists, Non Sequitur Scenes, Overly Long Gags, and its excessive use of Take Thats (though the occasional one does occur). Initially, the show relied on caricatures of political personalities, as well as some of the more visible and controversial aspects of the right wing's policies and ideologies (although granted, usually the Strawman Political version of said policies). Over time, however, as the characters' personalities began to be fleshed out, the show became less and less political in nature, to the point where only a small portion of the episodes featured politics as an active theme (curiously, as this was taking place, Family Guy was steadily becoming more political). The show began to grow its beard in the two-part episode "Stan of Arabia" midway through the first season. Since then, the plots have become more eccentric and arguably more entertaining as a result. The show has shown a willingness to experiment with unconventional storytelling techniques, such as "Star Trek", in which Steve's brief success as a children's author is told in the style of a 1940s Film Noir story, and "Of Ice and Men", which is related as a Princess Bride-style bedtime story told by a years older (and now human) Klaus to his young grandson. The quality varies wildly from episode to episode, but the risks the writers take often lead to excellent stories laced with snappy dialogue and strong performances from the voice actors. This page was last edited on 6 August 2017, at 21:36.